Our landscape was a huge selling feature for us when we moved in—green grass, nice landscaping, minimal maintenance—we loved it all. Then somewhere along the line, we started noticing changes. Our once sturdy walkway slowly began shifting away. Although we have attempted numerous times to adjust these sinking stones, it never really stayed in place. After a season change, we were right back at square one. Those same stones became a tippy, tilted mess. 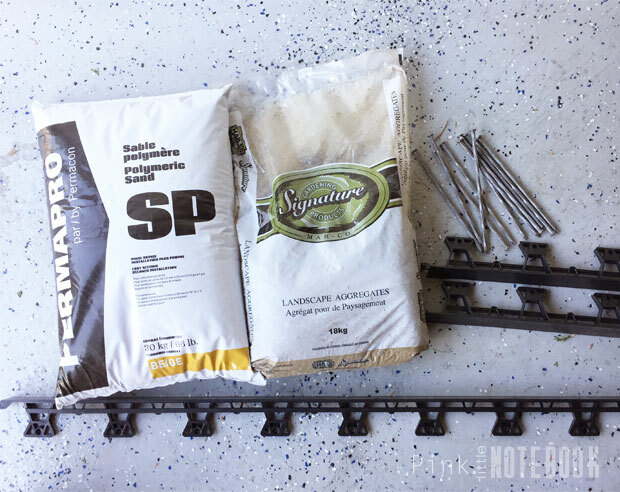 To rectify this situation once and for all, we visited our local landscaping store to make sure we got the right supplies for the job and to ask for a little advice on how to permanently fix our problem. I went prepared with a lot of pictures of the walkway and explained how some of the smaller paver stones on the right side were sloping down as the soil erodes. They recommended that we remove the entire right side of the stone pathway and redo everything to properly fix this problem. 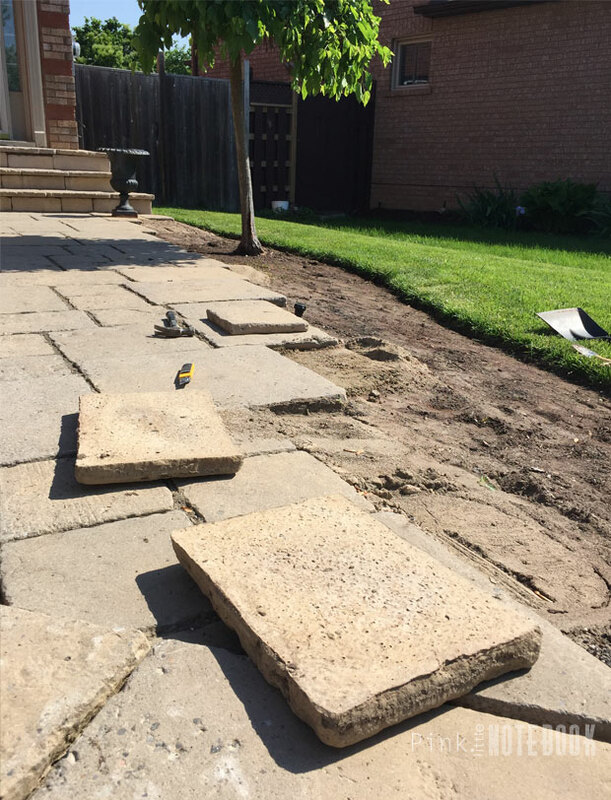 That means, we need to pop out 17 stones, dig out the old sand and gravel, create a new bed of gravel that is at least 4″ deep, put the stones back and then line the entire right side with plastic pavers edge to keep everything in tack. It really does make perfect sense but all I could think of is “what if we end up doing more damage than good! ?” Out of the 17 stones only 5 are in rough shape. In the end, we decided to leave the good stones as is and just focus on fixing the 5 shifting stones using the method they had suggested. 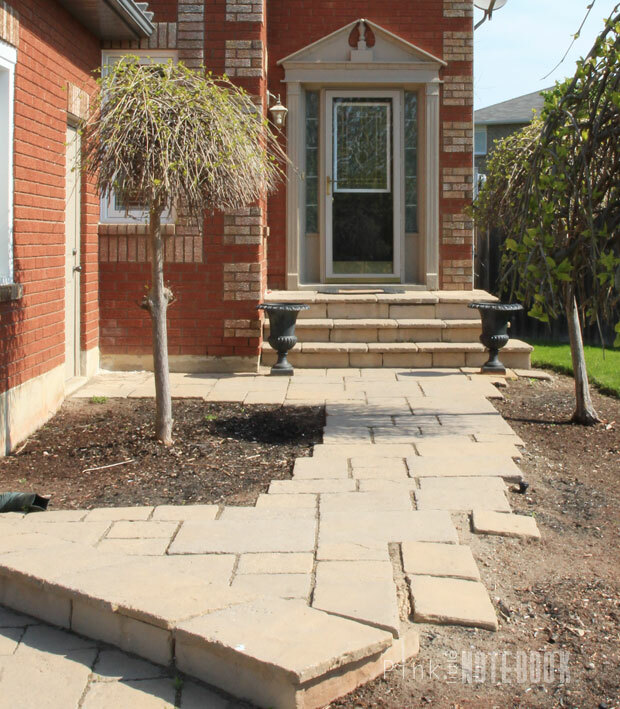 We purchased the supplies need—landscape aggregate (gravel), plastic pavers edge, 10″ spikes and polymeric sand. 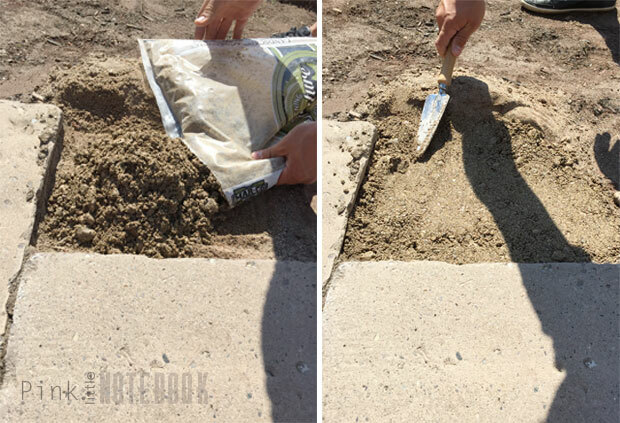 After we removed the stone, we dug out all the old gravel and made sure we had about a 4″ depth. We were told the key to guaranteeing long life is to get a solid, level base. We created a new 4″ bed of compacted gravel. We extended it just slightly past the stone just enough for the pavers edge to sit on. The plastic pavers edge acts as a wrap around each stone we are fixing. 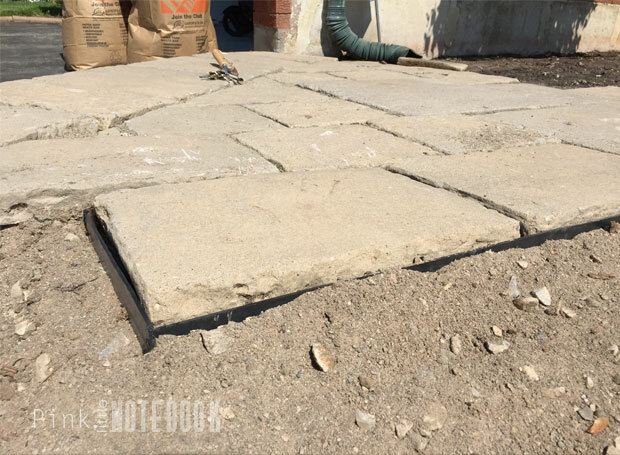 We trimmed it to the proper size and set it in place using 10″ spikes that we hammered into the compacted gravel. The spikes sit underneath the stone so make sure you dry fit everything prior to securing so you know exactly where to place the edging. We repeated the same steps to each of the 5 stones we fixed and so far it seems pretty solid. 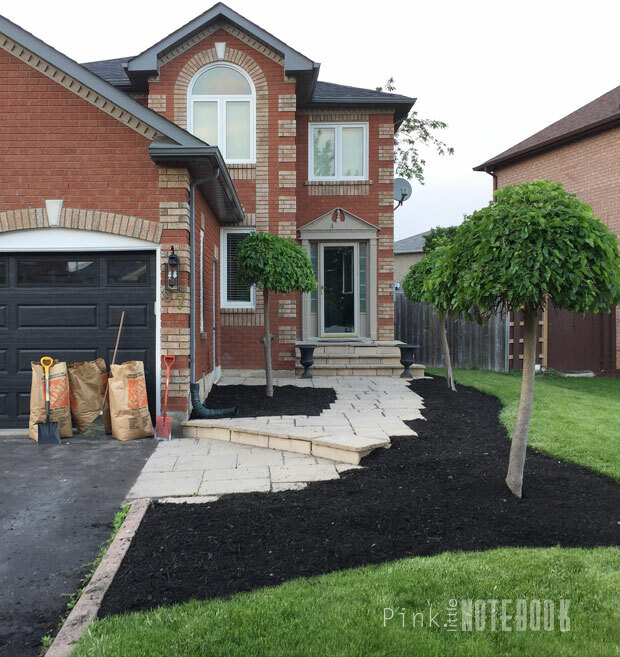 We used black mulch to cover the exposed dirt which, will do two things, 1) cosmetically enhance the curb appeal and camouflage the black pavers edge and 2) provide some protection to the exposed dirt and stop some of the erosion from occurring. 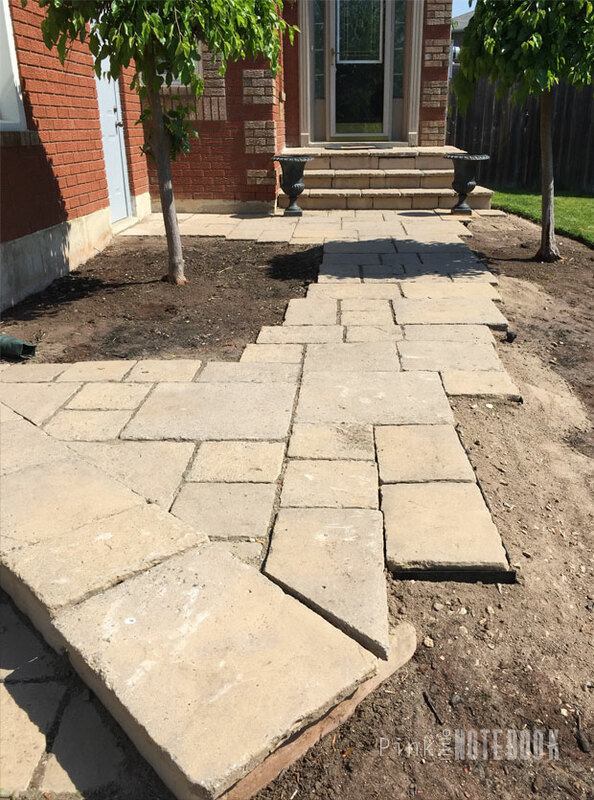 The last step is to fill the joint lines with polymeric sand which will not only hold everything in place but add the finishing touch. The stones must be completely dry (not just the surface but all the way through) before you can add the sand. We were also told for optimal results to make sure there was no rain in the forecast for the next two days. Since it has been raining on and off like crazy at the time we did this, we weren’t able to apply the sand. Be sure to follow me on Instagram and I’ll post our updates when we complete this step. I can’t wait to show you our plans with our front door next week! *Click through these links to see more about our exterior makeover: Updating our Curb Appeal, How to Repair your Crumbling Concrete Wall, Our new Garage Doors, Reviving our Exterior Front Entrance, Exterior Update, How to Renew your dated Driveway & Curbs, Five Ways to Upgrade your Front Door, Exterior Makeover: Before & After. Love how this turned out! Love DIY projects! I love brick houses, they’re so cute! Your walkway looks amazing! Such a nice brick house and I love the way the trees are cut! Great job on the project! It came out so well! Nice work! Your house certainly does have a unique appeal and I’m glad you got your sinking stones fixed! Wow, what a great job/improvement. I love it! We to need to do improvements right at our front door stoop.